There's nothing Gabe and I like more than an excellent steak house. I do not mind paying a little extra for a perfectly cooked amazing piece of red meat. That said, I have found myself let down more than once after paying over $100 for steak and wine for two. 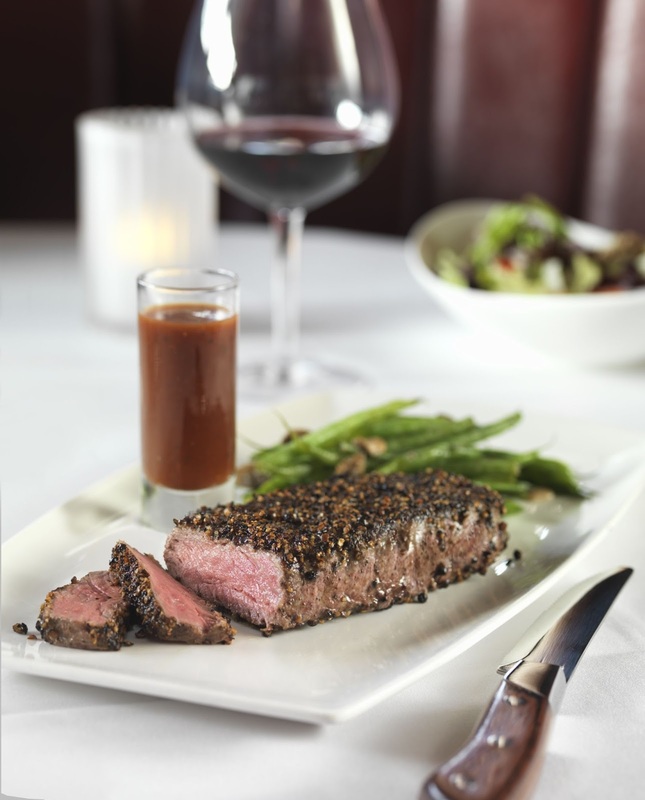 When Fleming's Prime Steakhouse announced their Savor & Sip, Perfect Pairing menu, I was instantly intrigued. 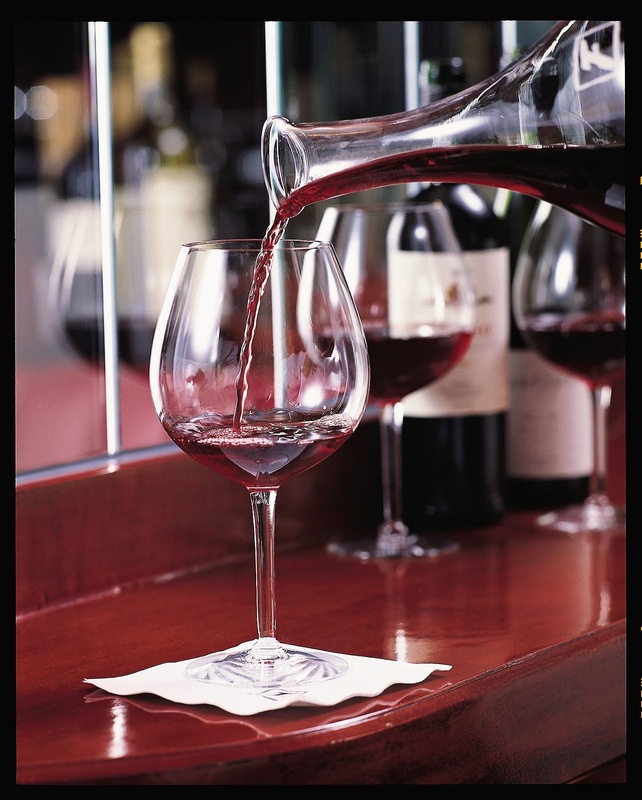 Through January 31st, Fleming's is offering two of their most popular steaks, Porcini Rubbed Filet Mignon and Peppercorn Steak (Prime New York Strip) with your choice of a Big Pour wine selection (specially chosen by their Director of Wine, Maeve Pesquera). This duo is only $49.95. Considering the normal price of both of these steaks, you are virtually getting a really large glass of wine for next to nothing. Your choice of four Big Pour Pairings (a 9oz pour which is equal to 1 1/2 glasses of wine) are: The Dreaming Tree Crush Merlot (Dave Matthews Wine! ), North Coast Women of the Vine Chardonnay, Central Coast Colby Red, Cab-Merlot Blend, California Franciscan Chardonnay, Napa Valley. I ordered the Central Coast Colby Red and my non-wine drinking boyfriend ordered The Dreaming Tree. Then my worst nightmare happened. I hear the words "I really like this wine. I would drink this wine. Can we buy this at a store?" Oh no.....there's only room for one wino in this family. 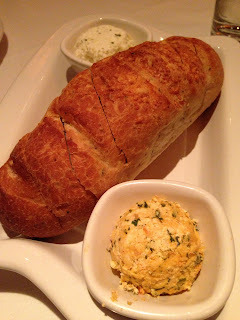 After we received our two huge glasses of wine, we were presented with a warm fresh baked loaf of Parmesan crusted sourdough bread served with two butters, a chardonnay feta butter and a tomato rosemary garlic butter. So much for laying off bread this week. I loved the Chardonnay feta while Gabe preferred the tomato rosemary. 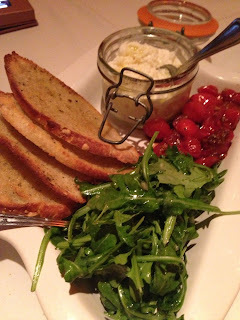 Not included with the Save & Sip event (but I strongly encourage you to order) is the Housemade Burrata served with charred grape tomatoes, wild arugula and toasted garlic crostinis. It is the perfect way to start off your meal at Fleming's. It was so amazingly delicious and I wanted to eat the entire thing, but I knew we had more amazing coming our way. 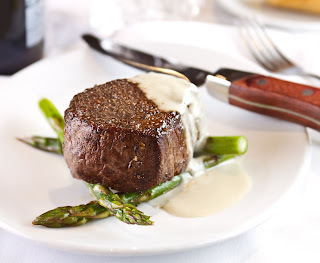 I ordered the Porcini Rubbed Filet Mignon, a center cut cooked to perfection served with grilled high country asparagus spears and topped with a gorgonzola cream sauce. It was completely out of this world. I usually eat half my steak and bring the other half home. I think I may have had two bites left over. Gabe ordered the Peppercorn Steak, a Prime New York Strip, cracked black and white peppercorns, proprietary “F17” steak sauce on the side and served with french green beans. I asked if they sold this sauce to the public and I was told it could be done. The F17 had a great smokey taste to it. Every bite of the steak, had that perfect char to it with an outstanding pepper taste. Again, this steak was cooked, seasoned and seared to perfection. 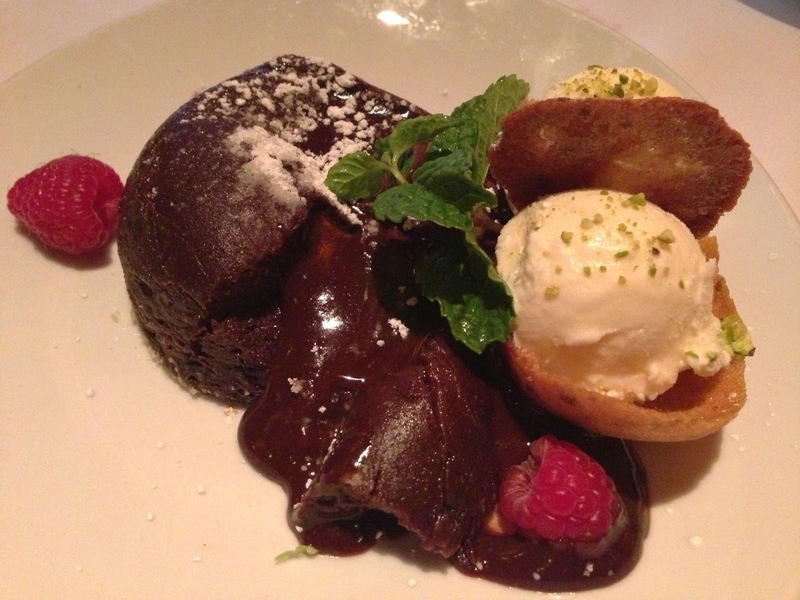 You cannot visit Fleming's without trying their Chocolate Lava Cake. It's simply the best Lava Cake I have ever tried. Rich and warm chocolate cake with a molten chocolate center of Belgian chocolate, served with vanilla ice cream and chopped pistachios. You owe it to yourself to checkout Fleming's Savor & Sip menu this month. Our service and dinner was perfect. This will make for a perfect date night! Just beware, your date may end up liking wine by the time the night is over. Oh my gosh. I NEED that burrata in my life RIGHT NOW! I have never been to Flemings! Heard great things, but never had the opportunity/time to drive out there. But I haven't gone to any steakhouses here in Tampa yet. Such a foodie slacker I am!